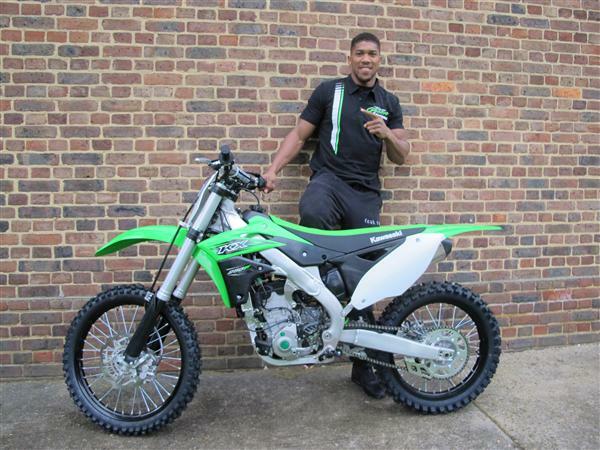 Home News World heavyweight boxing king Anthony Joshua loves motocross! After winning one of the greatest heavyweight fights in history against the legendary Wladimir Klitschko, Watford’s Anthony Joshua might have a little more time to spend riding his Kawasaki motocross bike – but maybe he should graduate to a 450! Back in 2015 Joshua was given a 250f by Kawasaki and was more than happy to get his hands on it! Anthony said at the time: “I’m so excited to get my hands on this bike. I’ve been planning to get it for months but I wanted to wait until after the fight so I didn’t lose focus. A lot of people are surprised when they find out that I enjoy riding bikes but I love them – I’ve been riding them since I was in my early teens and love spending time with my mates riding.